Worried about EMF radiation from your laptop? You aren’t alone. In fact, other than cell-phones and smart meters, computers (especially laptops) are one of our highest EMF radiation exposure risks. They emit all three forms of EMF radiation in large amounts. Even more concerning, is the proximity to our body that we often use laptops. Whether we’re typing up a report with the computer on our lap, or watching Netflix in bed with it on our stomach, it’s always close to our body. Now before I go any further, just a brief warning. This is the definitive guide on laptop radiation, so it’s a bit lengthy. I promise you it’s worth the read, and when you’re done you’ll be a bit of an expert. However, if there is one topic or another that you’re specifically interested in, use the convenient table of contents below. Why Is Laptop Radiation Dangerous? Laptop Radiation – What Is It? Laptops (assuming they are connected to WiFi) emit all three types. This is really important to know and understand because it will help us to know how to protect ourselves. So let’s just spend a minute talking about the magnetic field and electric field radiation, and then we’ll talk a bit more in-depth about radio frequency radiation. 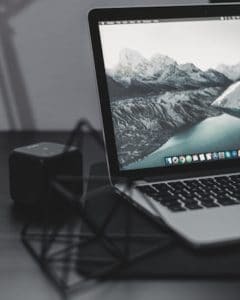 For magnetic fields, you’ll notice from your EMF meter that most of the radiation comes from the laptop monitor, and from a portion of the base. The LCD monitor and the logic board or motherboard will emit the largest amount of this type of radiation. The Long Island Power Authority published a study showing the magnetic field radiation at various distances for a wide variety of home appliances. For perspective, the United States Environmental Protection Agency (EPA) recommends you limit your exposure to between .5 mG (milligauss) and 2.5 mG. So you can see that when it comes to laptops, especially with magnetic field radiation, the margins of safety are really small. The other primary source of magnetic field EMF radiation from a laptop will be all the electronic components in the body portion of the machine. Specifically the motherboard and the power inverter. You’ll notice if you take your EMF meter, set it to magnetic field radiation, and move it over the body of the machine that the readings change. Different components will emit different types and amounts of radiation, but your cumulative exposure will likely be pretty high. When we think of EMF radiation from a laptop or any other computer, a lot of times what we’re thinking about is the radio frequency radiation. This is what is emitted when the laptop sends or receives wireless data. This could be a connection to WiFi, Bluetooth, etc. We’ll talk about each of these a little bit. The two actual sources of this radiation in most laptops will be the airport or wireless card (often integrated as part of the motherboard) and the Bluetooth Antenna. So for WiFi radiation from the wireless card, it will emit a measurable amount of RF radiation as the laptop stays connected to WiFi. Packets of information are sent and received by this component as you surf the internet or watch a video. I got these readings from my Trifield TF2 but got almost identical results from other EMF meters I tested with. Remember that whenever you’re getting readings of RF radiation, that you need to look at the “peak” number, and not the primary number which will be much lower. The reason for this is that information over WiFi or Bluetooth is sent in the form of packets, so think of it like very fast alternating currents. 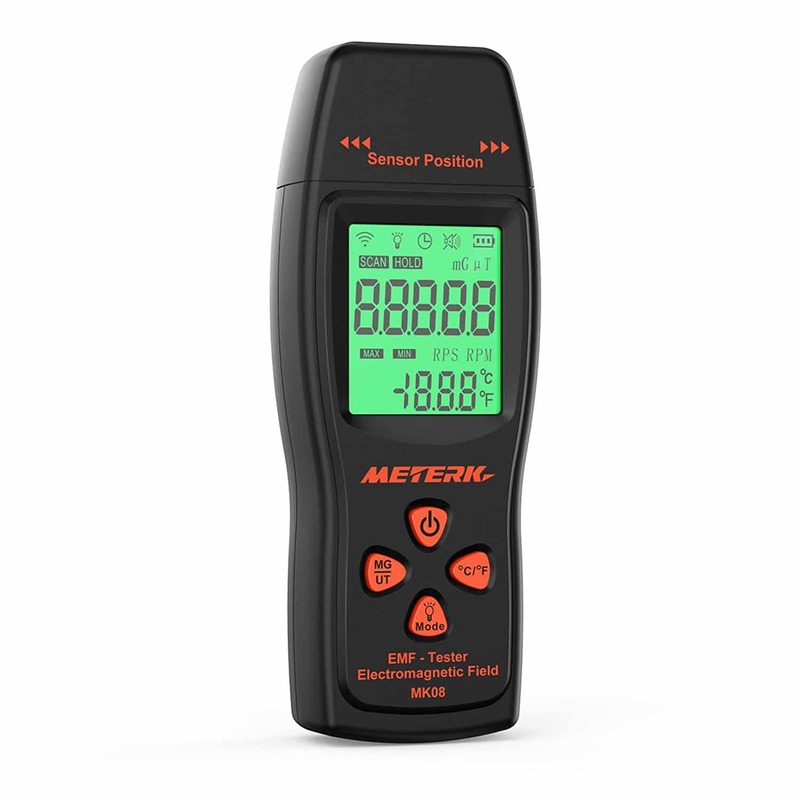 The “peak” number on your EMF meter assuming it has one, will give you a more accurate RF radiation reading, which is how I got the test results above. You can see from those readings, that if you get enough distance from your laptop, your radiation exposure falls off dramatically. However, this can be pretty tough. 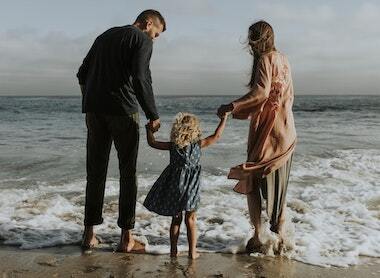 It can be reasonable to keep your head at least a foot or so away, which will put it close to the acceptable exposure range, but the rest of our body can be hard. There is something we can do about this, which we’ll talk about in the “how to reduce laptop exposure” section below. Just make a note though that you should try to keep your head at least a foot or two away from your laptop at all times. The other source of RF exposure from a laptop will be Bluetooth. Whether you have Bluetooth devices currently connected to your laptop or not, it will still be emitting some RF radiation as it searches for devices. However, the amount of radiation will be fairly negligible. If you want to eliminate this altogether, you can disable Bluetooth while you don’t have devices connected. If you want to read more about how Bluetooth works, and why it can be dangerous, check out my full guide here. Alright, now that we’ve talked about the various sources of EMF radiation from laptops, let’s go into talking about the specific dangers and risks a bit. I won’t go too in-depth about the general dangers of long-term cumulative exposure to EMF radiation in this post, because I have many articles about this already, instead I want to talk more about the unique dangers that laptops pose. One of the most common concerns you’ll hear about with laptops is the threat they pose to fertility by using them on your lap or stomach. One concern is the heat from laptops, which can get extremely hot and cause damage over time to sperm specifically. However, the more crucial concern is the extremely close proximity EMF radiation damage from using the laptop on your lap. Multiple studies have shown that using a laptop connected to WiFi on your lap for any length of time can significantly affect sperm count and quality, as well as cause DNA fragmentation. An article published online in 2011 showed that using a laptop on your lap for as little as 4 hours can result in sperm effectiveness being reduced by 25%. If you’re a man, one of the worst things you can do is use a laptop on your lap for any length of time. Remember that proximity is hugely important when it comes to exposure to EMF radiation. By using the laptop on your lap, you’re putting virtually zero distance between the EMF radiation from the laptop, and the important organs of your body. We’ll talk below in more detail below about how you can protect yourself from this, and safely (or at least more safely) use a laptop on your lap. This should seem like fairly common knowledge, but if you’re pregnant or trying to become pregnant, you should be very careful about your exposure to EMF radiation. One of the worst things you can do is use a laptop directly on your belly without significant protection. A study by Duke University published in the Journal of Fertilization in 2013 showed a correlation between cell phone and computer radiation exposure and increased chances of miscarriage. If you’ve read my recent enormous guide on EMF Radiation and the risks to Children I go much more in-depth about the EMF radiation exposure risk that laptops and other devices pose. I’d encourage you if you haven’t read that, to open it up in another tab and read it later. You should try to avoid using a laptop on your belly, or using other EMF emitting devices while you’re pregnant, but I understand that this can be really hard. One of the best products you can get to protect yourself is an EMF protection blanket. If you want to read more about this, you can check out the guide I wrote on these here. However, the idea is pretty simple. It’s a blanket that has an EMF protection material inside with a very high attenuation rating. My favorite from SYB has a rating of 38 dB, which means it reduces radiation by nearly 99.99%. This is also the blanket my wife used when she was pregnant. You just drape over your belly and upper body if you need to use any electronics, and it will your exposure risk significantly. Better yet, after your baby is born, these blankets can be used as baby blankets to help protect them in the crib. Most of them, including this one from SYB, use hypo-allergenic cotton on the outside of the blanket, so it’s soft and safe to use. Inside is a thin metal mesh of silver that blocks the EMR. Multiple studies have shown positive correlations between EMF exposure and DNA fragmentation. One study performed at Columbia University found that EMF radiation from things like laptops actually changes the structure of DNA, and could lead to increased cancer risks. More of these have been performed specifically with Cell phone use and the increased risk of brain cancers like glioma. However, the main takeaway is that the damage from EMF radiation is cumulative and you should do all that you can to reduce it. Although this isn’t specifically a laptop radiation issue, it is a correlating concern that you should be aware of. If you’ve ever used a laptop on your lap for an extended period of time, you’re probably familiar with this. Laptops, especially when used near max capacity, are not able to adequately cool themselves. This can cause them to get extremely hot, and sometimes even burn your legs. Known as “toasted skin syndrome” this is more common than you think and can be very painful. Even worse, it can affect the pigmentation in your legs or lap and cause lasting skin changes. Alright, now that we’ve talked about all the dangers and concerns from laptop radiation, let’s talk about some of the best ways you can protect yourself. There are quite a few ways we can protect ourselves from laptops, while still being able to utilize them. 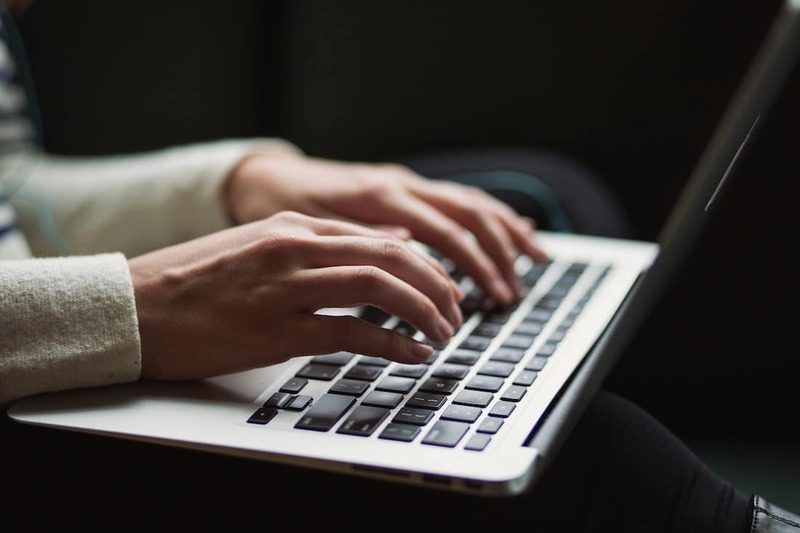 Laptops are incredibly useful and powerful machines, and many people rely on them for their careers, or for staying connected with friends and family. However, if you try to follow these suggestions, you’ll dramatically reduce your exposure. This one is boring but really important. Try to remember that the damage from laptop radiation or any EMF radiation is cumulative. The less you are exposed, the less danger you’ll be in. Unless you are electro-hypersensitive, meaning you often feel immediate physical symptoms when exposed to EMF radiation, you aren’t likely to immediately feel the effects. I think a lot of times when reading articles like this one, or others online, it’s easy to feel like EMF radiation exposure is this immediately dangerous thing. But it’s important to remember that we are almost always exposed to at least some level of EMF radiation. You don’t need to be overly concerned by one exposure or another. The important takeaway is that anything we can do to lower our long-term cumulative exposure is best. That is the case with laptop radiation. We can still use our laptops when needed, but lowering our risk will help us feel better, and be safer. I think if you own a laptop then this is an essential thing to own. In fact, I wrote up an enormous post, just on the 5 best EMF Protection laptop shields that you can check out if you want. If you don’t though, I’ll sum it up for you. Basically, they are stiff pads made out of material that entirely blocks EMF radiation. 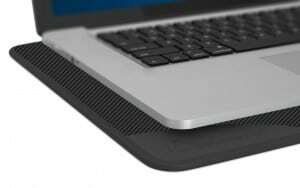 Usually, the surface will be grippy so that the laptop nicely sits on top without sliding off. Not only do they block all the EMF radiation from going straight down to your legs, lap, or belly, but they also block the heat as well. My favorite laptop pad (not case) is the Defenderpad by Defendershield (you can check it out here). It’s well priced, attractive, made well, and does a fantastic job blocking radiation. On top of all that, Defendershield is just a great company that you can really trust. They test all their products in an FCC accredited lab and publish the results right on their website. So this laptop pad actually uses three different layers of material that allow it to “block, divert, and absorb” up to 100% of laptop radiation. I don’t want this post to turn into an ad for their product, I just wanted to mention it because I really like it. If you want to know more, you can check out their website, or watch the short video below. Although laptop radiation shields like this one work fantastic for your lap when you’re sitting on the couch, or watching something in bed, you should also use it even on a desk. Most desks are not made out of a material that will attenuate radiation whatsoever, so don’t be fooled into thinking you’re completely safe just because the laptop is a few inches above your lap on a desk. Get an EMF radiation shield like this one, and just always have it with your laptop to use. This one is self-explanatory. If you aren’t currently using the WiFi, just turn it off. Many laptops have a switch or a button that you can do this very easily. If you have a Macbook just to go System Preferences > Network > WiFi > Turn Off WiFi. When you need it again, just turn it back on. Doing this simple task will lower the EMF radiation exposure from the laptop significantly, as it will virtually eliminate the RF exposure. If you do need the internet, and it’s not too large of an inconvenience, you should really try to plug into an ethernet cable when possible. This will give you even more reliable internet access but will lower the laptop radiation significantly, as it doesn’t have to wireless transmit packets of data. Alright, those ideas should get go a long way when it comes to lowering your EMF exposure from laptops. Ultimately there are tons of convenient devices in our life, that also pose at least some EMF radiation risk. The key isn’t getting rid of these devices completely but instead finding simple ways to use them safely and in moderation. Remember that the best things you can do are to limit use, get distance, and get shielding. I truly hope you found this guide helpful, if you did, please consider sharing! I’m thrilled and grateful to have found your website!! I studied EMF is college 20 years ago and can’t believe how little the world knows about it. Thank you for your thorough research! Quick question: My older son goes out with his friends and for safety reasons I want his cell phone on him. The guys don’t have backpacks on them when they are out so that’s not a realistic option. If he has the DefenderShield case cover – that would eliminate the EMF exposure while in his pocket? Yes I think the DefenderShield case is a great option for this! Just make sure he keeps the front flap closed and towards his body!